Don't Text & Drive! It Kills! Order Your Texting Thumb Bands Now! In Stock! Awareness Campaigns for Don't Text & Drive! It Kills! Don't Text & Drive! Let's Save Lives! Take the Pledge! wear the Band! Don't Text & Drive! Take the Pledge! Wear the Texting Kills Thumb Band! Join the Fight to End Texting & Driving! Take the Pledge Wear the Band! Free Pledge Form with you Custom Logo in Digital format to print. Police Departments, High Schools, Universities, Health Departments, Driving Schools, Fire Departments, Businesses, Insurance Companies, and In Memory of a Loved one who lost their Life while Texting and Driving! In Honor of Joshua Evans a Message of texting and driving dangers is clear! Don't Text & Drive, Take the Pledge! Wear the band! In Loving Memory of Joshua C. Evans, 37 the Father of two kids, from Ohio lost his life while Texting & Driving. The family is passing out the Pledge with thumb bands to help bring up Awareness "That Texting While Driving Kills" Our Thoughs and Prayers are with has family and friends. Please let's all help save Lives! Don't Text & Drive! It Kills! Don't Text & Drive Thumb Bands & Rings! Take the Pledge! Wear the Band! Don't Text & Drive Thumb Bands! Order Now In Stock or Custom with a Free Pledge form customized in digital format. 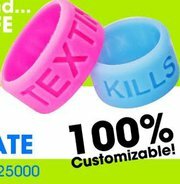 Buy Texting Kills Thumb Rings In Stock Pink or Blue! Free Pledge Form Customized! Don't Text & Drive! Take the Pledge! Texting Kills wear the Band! are Joining Forces to End This Problem! We can help you start a Campaign to Stop Texting While Driving! Help Us Save Lives! Don't Text & Drive! Take the Pledge! Wear the Band! Tatum High School Students Take the Pledge and Wear our Bands to support Lillie's Law! Lillie's Law! Tatum High School Students Take the Pledge and Wear Texting Kills Thumb Bands by EliasPromos to Honor Lillie Propes! High Schools, Universities, Business, Counties & States have joined forces to stop this problem. In Stock Thumb Bands in Pink or Blue with Texting Kills or Text Free Driver! Free Pledge form with you logo in PDF format. 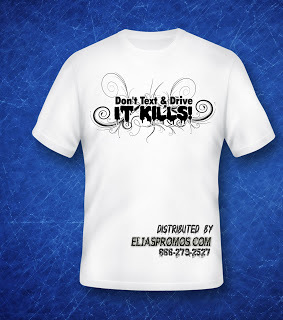 Free Post in PDF with our logo to Stop Texting and Driving. We can help your School Start a Don't Text and Drive Campaign.